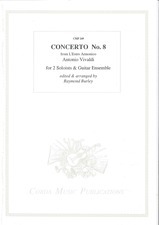 VIVALDI Concerto No.8 from 'L'Estro Armonico' (RV522) arranged by Raymond Burley for two solo guitars and guitar quartet. L'Estro Armonico, first published in 1711, was Vivaldi's opus 3 and was the work which launched his reputation around Europe. It consisted of 12 concerti, variously scored for one, two and four violins with string orchestra. J.S. Bach was one of the first composers to be influenced through this composition by the creative genius of Vivaldi. The present arrangement for guitar ensemble is scored for two soloists and a four-part accompanying ensemble. The edition supplies a score and a set of parts. Additional parts for larger ensemble can be ordered separately whenever required. Because of awkward page turns in some of the parts loose pages have been supplied to help in performance. These can either be taped to the main part or spread over a wider music stand.